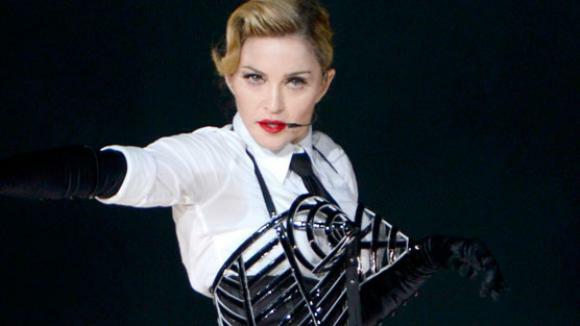 Madonna is making sure to leave each concert with a (not-so-great) memory. After recently taking a spill while on stage in Dallas, the controversial singer drew some boos from the crowd in New Orleans last night after she began praising President Barack Obama. "Who's registered to vote," she asked concertgoers, and then followed with, "I don't care who you vote for as long as you vote for Obama." After the crowd took issue with her remarks—in the form of boos—the Material Girl went on to say, "Seriously, I don't care who you vote for. Do not take this privilege for granted. Go vote." Last time Madonna mentioned Obama, and made headlines about it, was when she told a crowd in Washington D.C., "So, you all better vote for f--kin' Obama, OK? For better or for worse, all right, we have a black Muslim in the White House!"